I’ll fix the title to this post eventually but I didn’t want to give away the name of my nature discovery too soon. I was outside on Friday, keeping an eye on the children as they jumped on the trampoline, and as I wandered over to the stream I noticed what I thought was white fungus growing on a slender trunk of a bush. I was curious about it so I walked over to take a closer look. It was like cotton, with pure bright white wisps of it gently waving. I noticed a couple of ants and thought how strange….ants tend to be attracted to sweetness. I got closer and closer, making up my mind that it probably was not a fungus. Not like any fungus I had ever seen before (I haven’t seen much, I admit). It was wrapped right around the branch, and when I touched it with my fingertip it felt squishy and alive. I bent the stick down to look at the other side. And I realized that underneath all that whiteness was filled, FILLED with tiny little bugs. 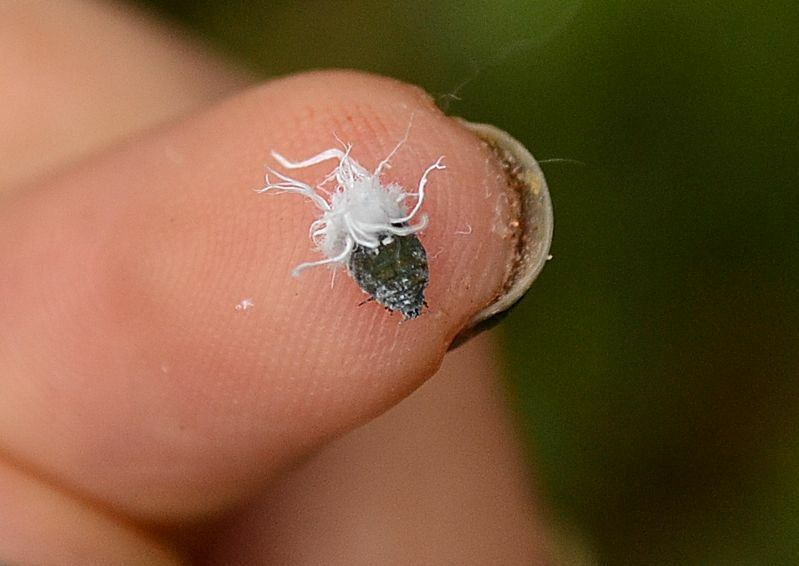 Some were as tiny as lice, and others were about the size of a radish seed. All of them were soft and gray with little legs. They moved! A creepy, itching feeling came over me (all in my mind), I kept studying the thing, like I couldn’t stay away! I went into the house to Google, not really believing it would be a quick answer, but I had to know the name of what I discovered. 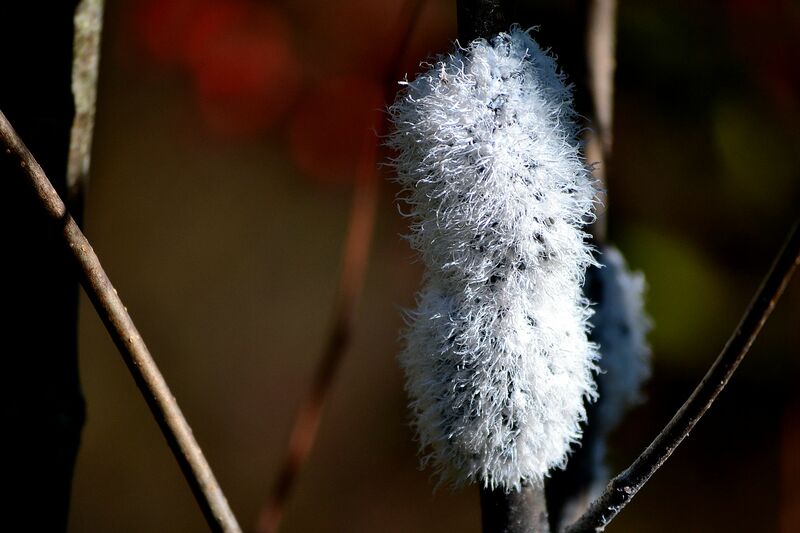 I typed in: “looks like cotton on a tree branch but it is really bugs” and the very first link that popped up was about Woolly Aphids. Woolly aphids are so weird! 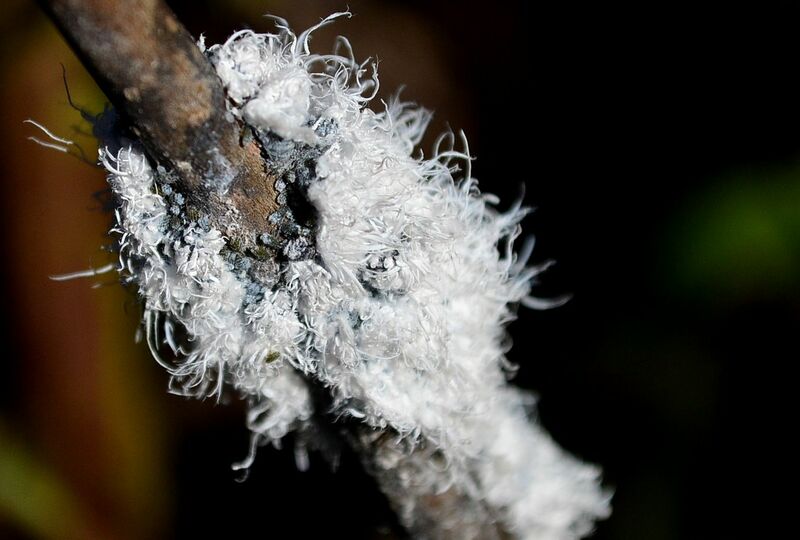 They are (and I quote) a sucking insect that lives on plant fluids and produces a filamentous waxy white covering which resembles cotton or wool. The adults are winged and move to new locations where they lay egg masses. – Wikipedia. What I discovered were little baby woolly aphids, clumped together as a safety precaution. The white stuff was a wax that they produce as a camouflage. But get this! They secrete something sweet called HONEYDEW, which is what was attracting the ants. I can’t get over it! HONEYDEW! God is amazing. God is creative. God is fun! 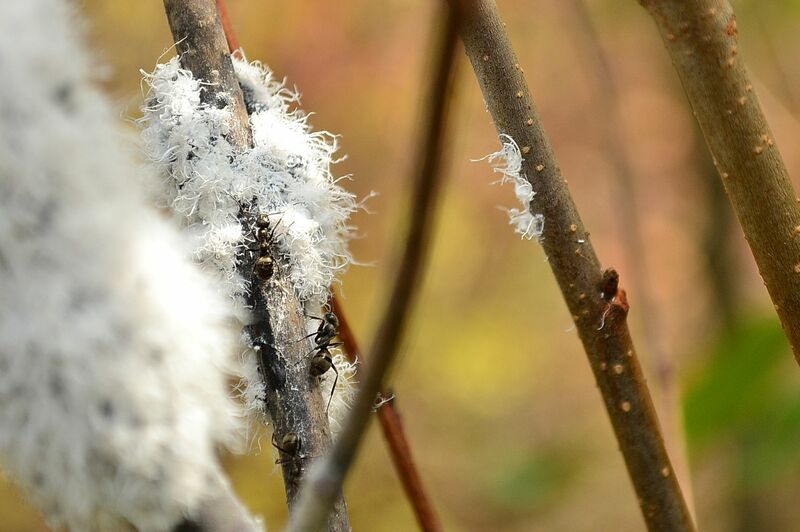 My family is so obliging and when I asked them, “Do you want to see the Woolly Aphids?” they all came along to see. They didn’t really say yes with enthusiasm, but still, they came. Ants trying to find some sweet honeydew. One of the larger aphids, with it’s waxy strands coming out the end. On Grace’s fingertip. I did wonder if they were harmful, should I destroy them? But from what I read online, they are not a cause of great concern, so I left them be. They were outside on the wild bushes by the wild stream and doing no one any harm, so they could stay. They will grow up and turn into little tiny flying bugs. I knocked a couple off the branch when I was showing them to Grace and she felt sorry for them, but that was taking “nature love” a little too far, I thought. This entry was posted in nature by Shanda. Bookmark the permalink. And yes, that is kinda gross. And kinda interesting. Well, good afternoon to you! Thanks for the hello on my blog! I just had to come over and see what it was (hopefully my homemade bbq sauce won’t boil over while I say hello in return. I have never seen such a thing!! They are kinda gross but cool too 🙂 God sure suprises me with his strange creations over and over and over. Isn’t he amazing!? Baby bugs are often strange looking. I wonder if we have such a thing in our area. I found a pretty mustard colored mushroom out picking apples the other day and thought of you 🙂 Happy Monday friend! Shanda! I’ve missed you. I don’t know how I lost you, but I’m glad to read here again. And thank you for the lovely cards. Must.reply.soon. Your blog is the same as ever, peaceful, serene and beautiful, just like you and your family. I was fascinated with this post. I love reading about new creatures and things. Love to you. Luci, I am so glad you found me again! I’ve seen your comments on the others’ sites but when I clicked on your name it took me back to Xanga. Will you be blogging again at some point? I have your painting in my room and think of you every time I see it! Blessings! That is crazy!! I’ve never heard of this before, but what a marvel!! I love your love for nature and Gods creations! That’s a cool looking bug, and a very nice shot of it, too. This was fun to read! I’ve never heard of these bugs before!